It is strong rumors in the industry that on top management meeting Sony started to discuss fully axing mobile communication division and specifically smartphone production. Big consequences can be hike of CMOS sensors prices, as now lot of development expenses are being hidden in the smartphones department financials. Management do not want clients to know that Sony is not so competitive in the sensors area in the cost terms. This can also lead to breakup of hidden agreement with Samsung and return of Samsung into consumer cameras market within few years. Sony Mobie Communications has revised downward its shipment target for smartphones for fiscal 2018 (April 2019-March 2019) to 6.5 million units from seven million projected previously. The revised figures will represent a decline of 51.9% from the 13.5 million units shipped a year earlier. Whole thing can be way to get rid of most successful manager by axing him with most problematic division. And it is he personally who still guides and protects Sony mirrorless development program. Sony Mobile is losing its independence. The division will be combined with Sony’s TV, audio and camera products into a unit called Electronics Products and Solutions. The company presents this as a move to increase the synergies between various Sony electronics – the Xperia line already borrows heavily from the TV and camera divisions. 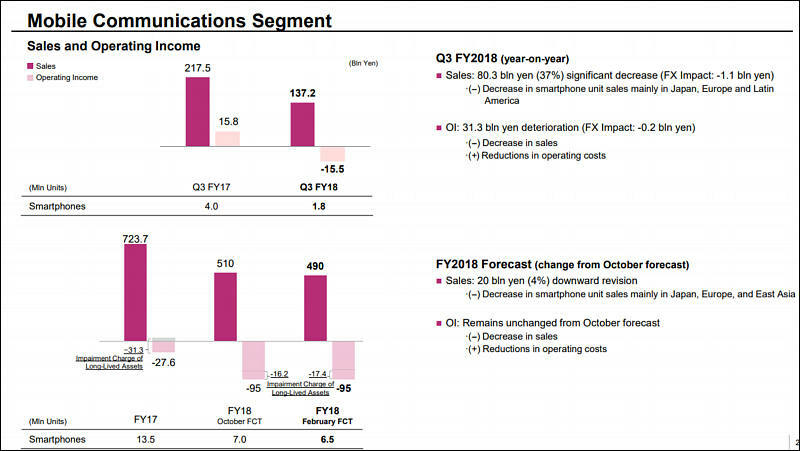 For what it’s worth, Sony will keep reporting the financial performance of its Xperia smartphones. Still, some worry that this is an attempt to hide the losses from the mobile division by grouping it with Sony’s more successful units. Actually it means end of Sony Mobile division as had been predicted. Get ready for more CinaAlta phones! Sony is cutting up to half its smartphone workforce as sales shrink in the face of stiff global competition. By 2020 most probably we won't see any globally sold Sony smartphones, they can stay on home and few other markets. Sony shutting smartphone factory in Beijing and shifting production to Thailand. This closure is part of aims to turn around its loss-making handset business by April 2020. The company didn’t disclose the number of jobs which would be affected. Things are becoming worse each day for Sony. Expect big surprises in imaging department in coming months.